Corinthian have introduced an exciting new range of Disney miniature figurines. 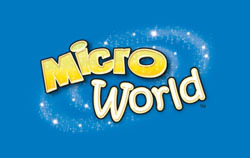 Disney MicroWorld is the first range in Europe to feature all of Disney's much loved characters. A.A. Milne's iconic and lovable bear stars in a special series of MicroWorld figures. Pooh is joined by all his friends; Piglet Tigger, Eeyore, Rabbit, Kanga & Roo. There are 21 figures in the Winnie-The-Pooh series. All are available now. Some of Disney's iconic characters are included in this classics release. Along with Mickey Mouse, Donald Duck, Goofy & Pluto are some classic Disney film characters. Dumbo, Robin Hood, Simba, Baloo are just some of the wonderful Disney characters available. Pixar Studios have worked with Disney to produce some of the best animated feature films in recent years. The stars of some of their much loved titles can now be yours. Characters from Cars, Wall-E, The Incredibles, Finding Nemo, Ratatouille and Monsters, Inc. are all included. The figures from each film can be seen by clicking on menu item to left of this page.